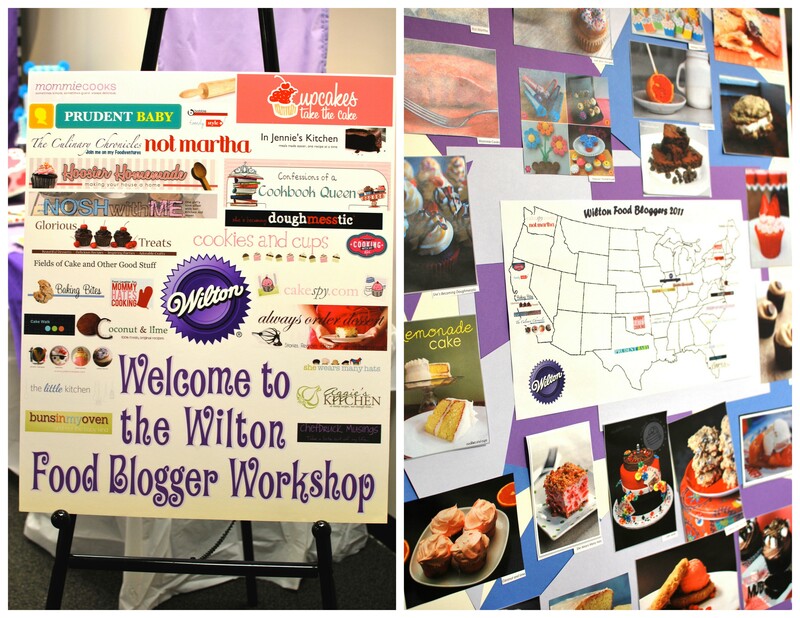 A few weeks ago I was flown out to Chicago to attend the Wilton Food Blogger Workshop <insert high-pitched squeals of joy here>. It truly was an honor to join 26 amazing food bloggers from across the country for a trip filled with all things Wilton! 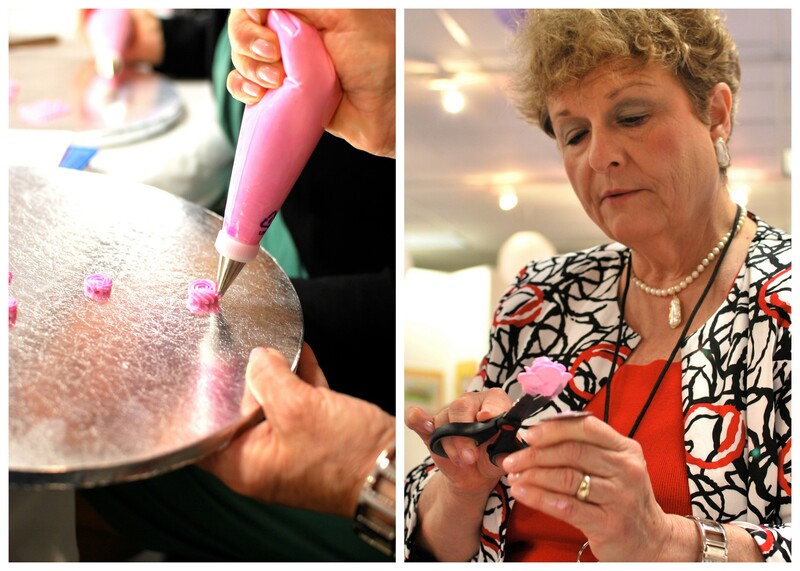 We spent the next several hours practicing our piping skills, experimenting with fondant, touring the site, and learning about the hottest Wilton trends. Sandy Folsom, Director of the Wilton School, was our main instructor for the day. 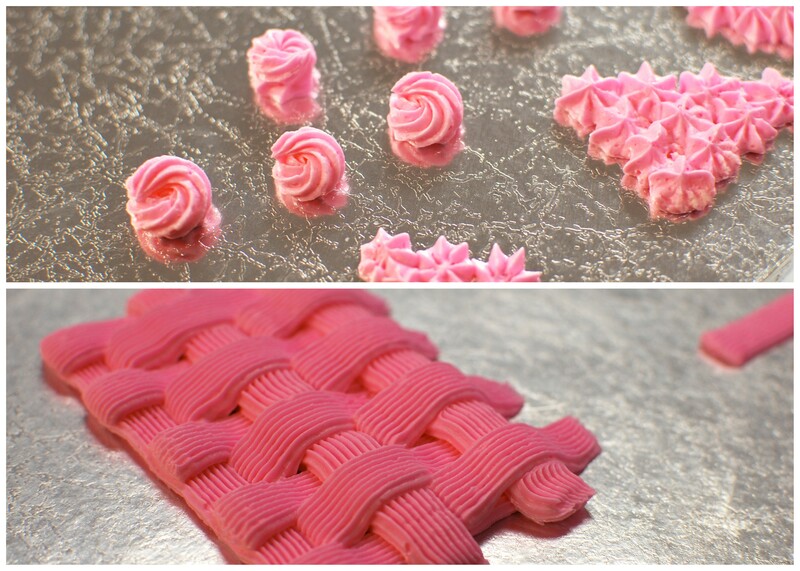 Some of my buttercream rosettes, stars, and basket weave. 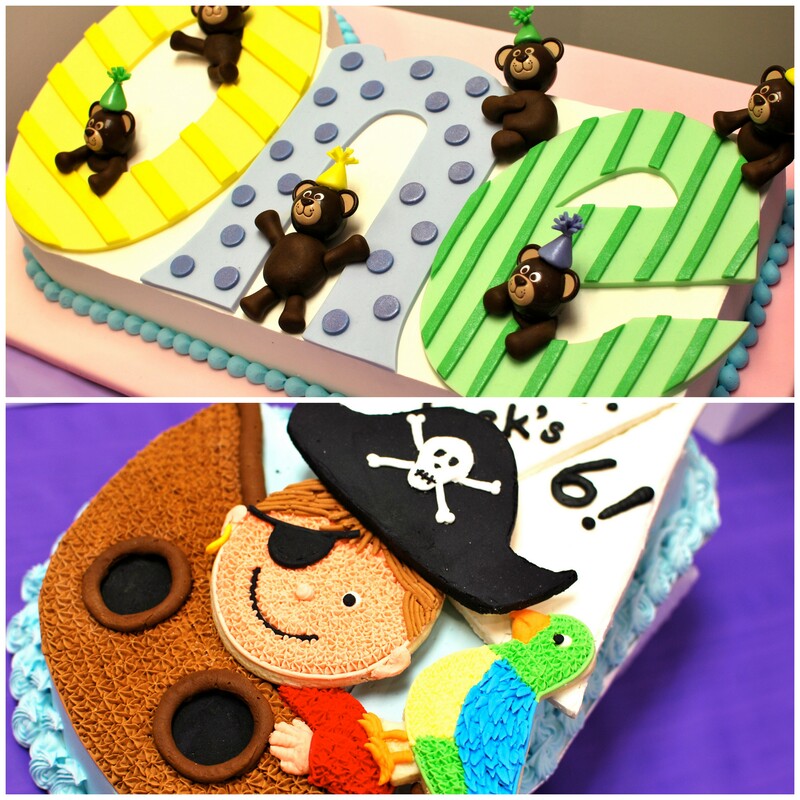 And of course, what better way to demonstrate our newly acquired skills than a cake-decorating competition! We were broken into teams and given about an hour to decorate a two-tier cake. 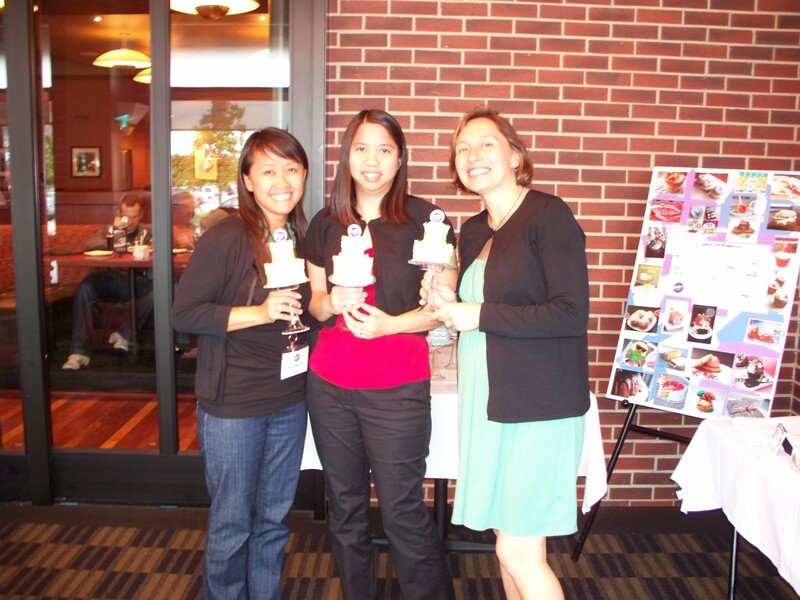 My fabulous teammates included Julie Deily of The Little Kitchen and Vanessa Druckman of Chef Druck Musings. Some of our competition supplies. Our bright and colorful “spring” themed cake. As I had mentioned, we did a quick tour of the facilities that included the prep rooms, photo studios, and testing kitchens. Snapshot of a photo set up. 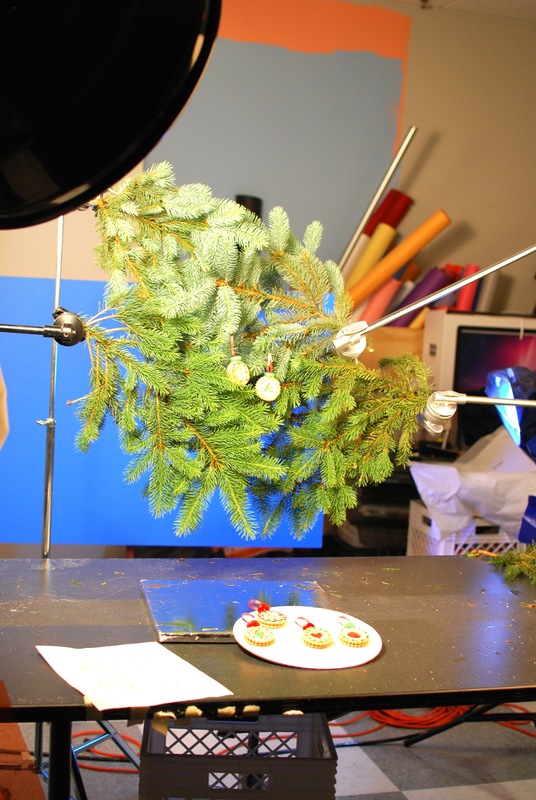 And yes, those are holiday items being photographed in June! We were then zipped away to a quick stop at the Wilton School and the Wilton Enterprises. The talented Colette Peters happened to be teaching a Masters Course when we arrived at the school. I was a bit giddy when we saw her—so much to the point that the pic I snapped of her was so blurry that I’d rather not post it. 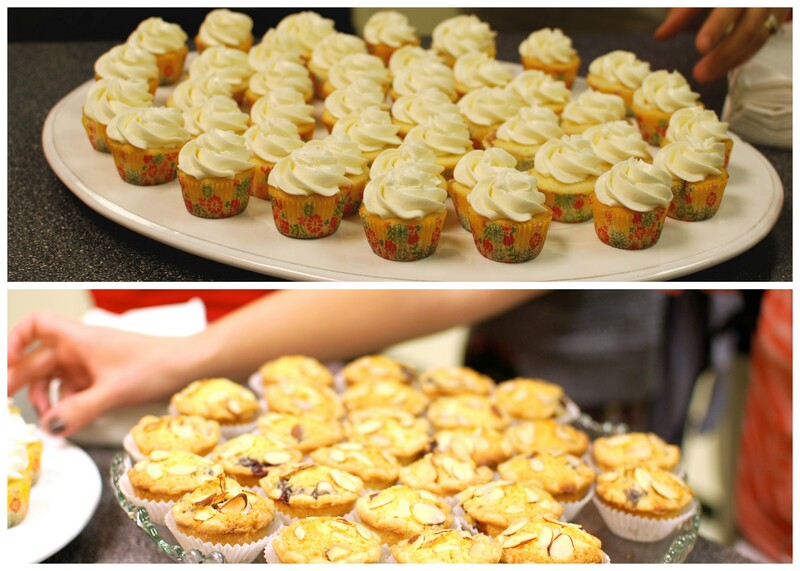 We did a little sampling of goodies in the test kitchens. And what could top a day filled with cake decorating, photography, eating, and meeting talented food writers? 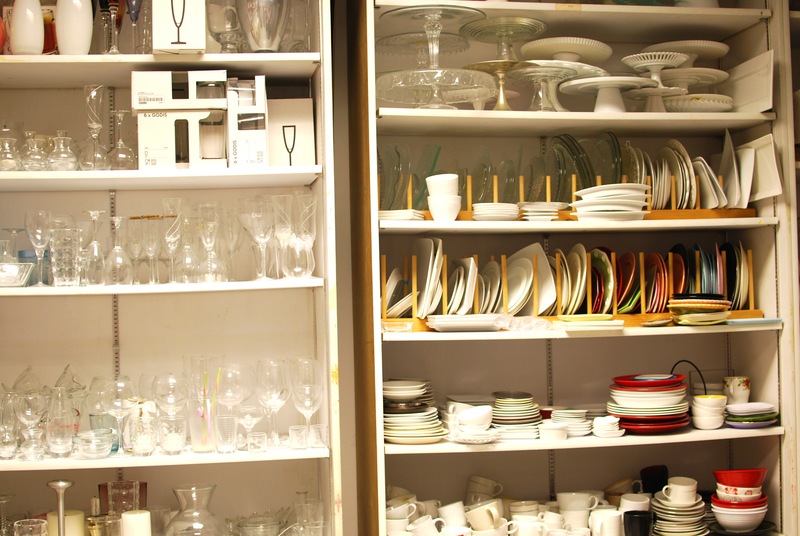 Just one thing really……SHOPPING!!! Our day ended with a celebration Awards Dinner where we all got to enjoy delicious food, recount on a wonderful trip, and were given awards from the cake decorating competition! Our awards for the evening. 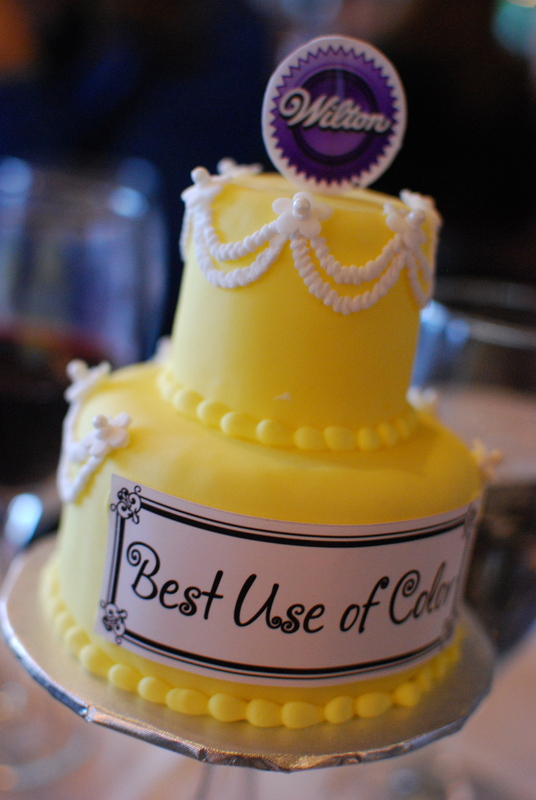 Our team took home the award for “Best Use of Color”—and we sure did use tons of it! It truly was an AMAZING, fun-filled, and jam-packed trip! 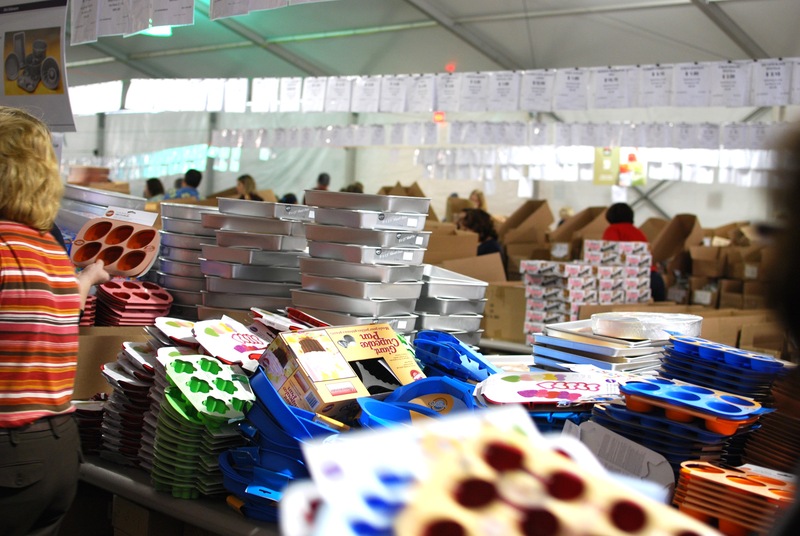 In addition to gaining more exposure to Wilton and their long-standing contributions to the baking world, I am honored to have been in such wonderful company with the talented food bloggers in attendance. I look forward to our continued friendships! And after a good amount of persuasion and encouragement from these talented ladies, I FINALLY took the plunge. 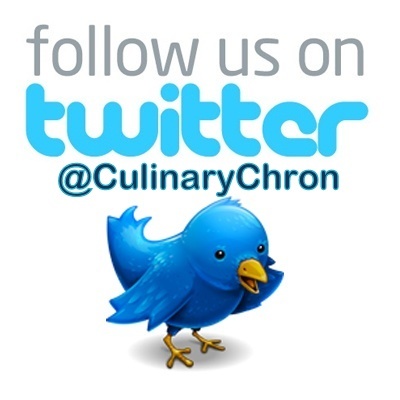 Yep, it’s true—we’re now on Twitter! And if you haven’t done so already, be sure to “LIKE” us on Facebook! I’d like to extend a huge hug of gratitude to Wilton for such a memorable experience. THANK YOU for your extreme generosity and for taking such good care of us! 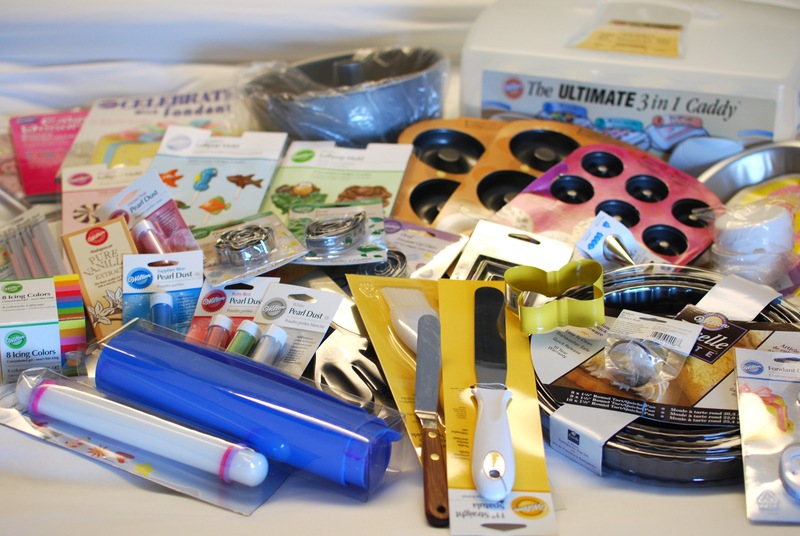 Disclosure: Although I received Wilton products and the trip to the Wilton Food Blogger Workshop, all opinions and views are my own. Wow. I am so so so jealous! Wow! 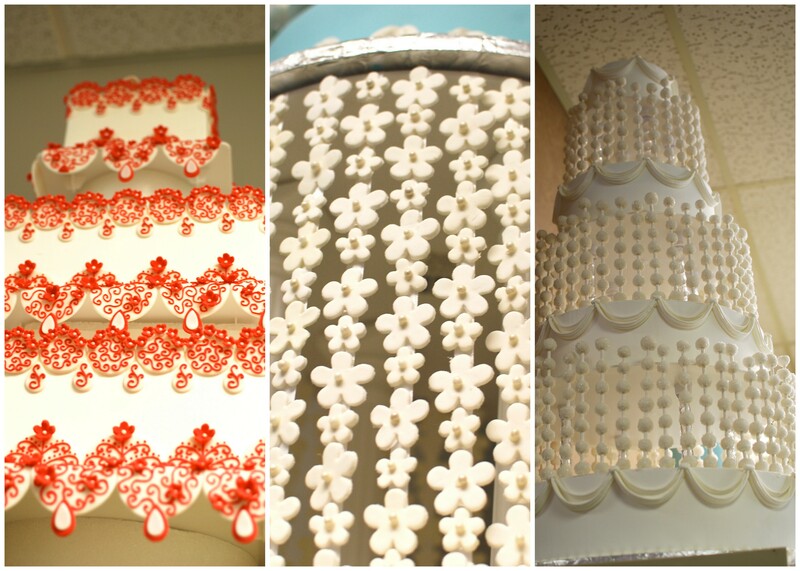 Beautiful cakes… I can’t wait to see your new skills! 😉 Looks like you had fun! So great to actually meet on our way out the door! 🙂 What a fun trip, your photos are gorgeous and so is your cake!! I’m jealous too! 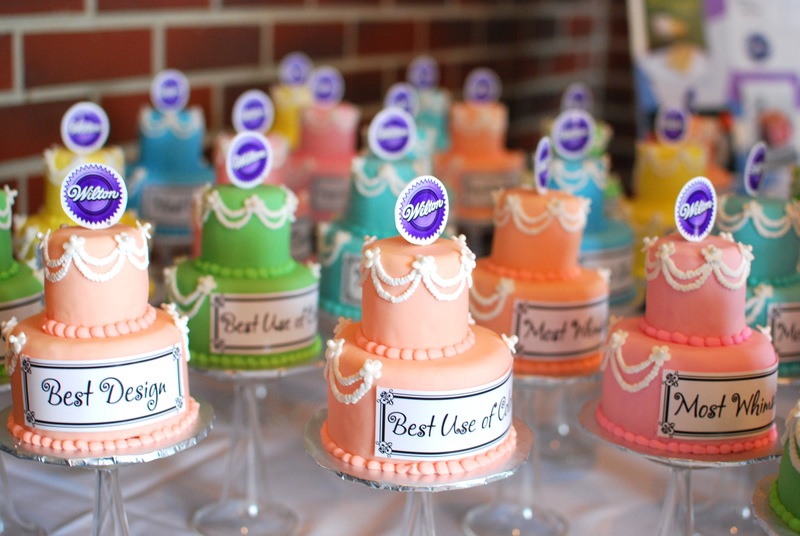 How amazing to attend such an event, especially if you like to bake and decorate! 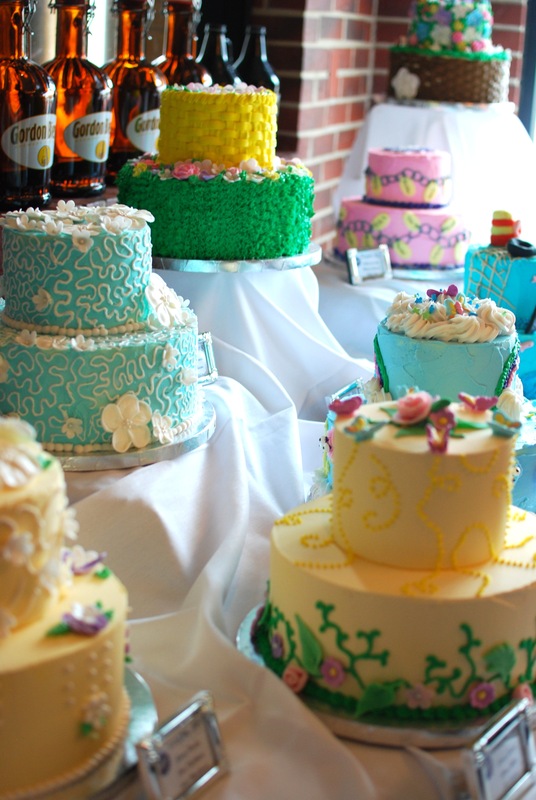 I wish I could…I can’t decorate cakes to save my life so I tell people that my cakes are “homestyle.” Love your spring flower basket cake design, so colorful and whimsical. what a great trip! went to the local one here in south bay but a trip to the headquarters in the windy city can’t be beat! WOW! Lucky you! Looks like you had so much fun and learned a lot too! It was so nice to meet you!!! Love your photos. So glad you joined twitter 😀 Let’s keep in touch. reminds me of when the kids won the trip to visit willy wonka and his chocolate factory. : P is colette peters as smiley and reminiscent of mrs. claus in person as i imagined she’d be? This looks like so much fun! I’m honestly jealous. 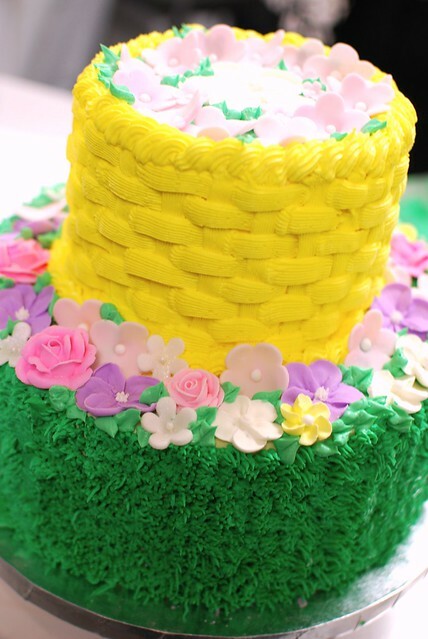 Your springtime cake is gorgeous, and I’m impressed by the basket weave, trying to figure out how you did it. 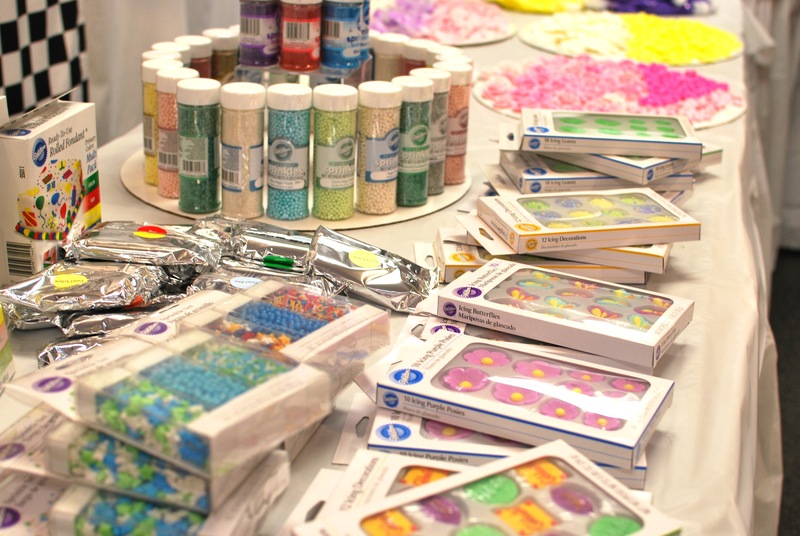 I recently took Wilton’s Decorating Basics Course and fell in love with their products. Their variety of decorating tools is just amazing.